Centipede holds a special place in gaming history as the first arcade game to be designed by a woman. Even though Atari touted this fact (a clever marketing ploy), Centipede was actually a collaboration between multiple people including Dona Bailey and Ed Logg. It is said that Dona came up with the game concept and did half the programming, while Ed Logg did the other half. 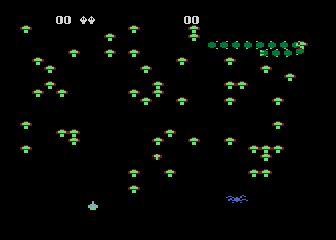 The marketing ploy worked and Centipede was the first game to be more popular with women than men. I guess all women really do have a deep hidden desire to kill every bug they run across. It's a well known fact that for the most part Atari 400/800 and 5200 games are exactly the same (same hardware, same games), but there are a few games out there that are different. 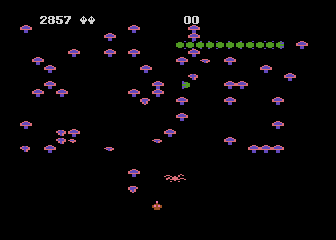 Centipede is one of these games. 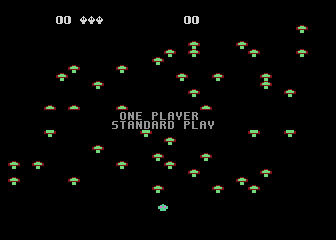 The Atari 400/800 version was done by David Getrue in late 1981, and while this version was adequate (done entirely in character set graphics), Atari wanted something better to show off the power of its new system. 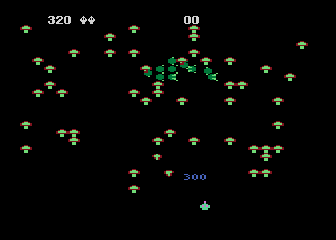 So in 1982 Frank Hausman & Sean Hennessy created a new version of Centipede featuring graphics that were very close to the arcade and offered support for the new 5200 trak-ball. It's no coincidence that Centipede is considered to be one of the 5200's best games as it shows off the machines power beautifully. As an internal pet project, the programmers created a super hard version of Centipede dubbed "Killer Centipede". This version moved at a much faster pace and featured amazingly smart spiders (and more of them). Although this version of never meant to be released to the public, more than one prototype is rumored to be out there. Expect more information on this version as soon as the rom surfaces.